This young great egret was testing his wings in a large nesting colony located in the Campostella Heights neighborhood in Norfolk Virginia. 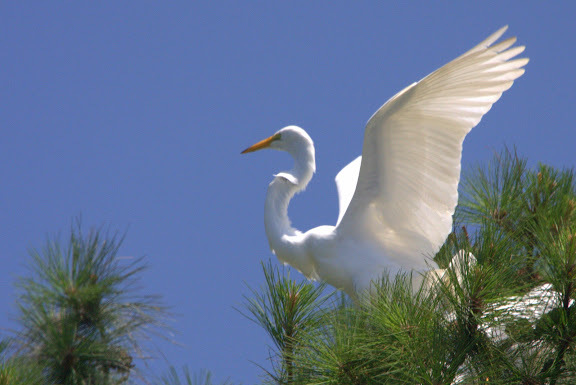 There were hundreds of egrets in nests high up in the pine trees. While beautiful to watch, the nesting colony can make a real mess. Some residents appear to have cut down or severely trimmed tress to rid themselves of the messy birds. Canon 40D, 1/500 @ f/9.0, ISO 400, zoom at 400mm with a 1.4x extender. I love driving by there when it is nesting season. I am not sure if they took up residence in my garden whether it would be a blessing or a curse.